Cities across the U.S. are joining in a global movement to improve the quality of their decision making and planning through increased access to data and by integrating collaborative approaches to making that data more accessible to government officials as well as the public. In many larger cities, 311 service centers are becoming a core driver to building capabilities for service integration. Since the first 311 hotline launched in 1996 in the City of Baltimore, 311 service centers have rapidly spread across the country. 311 systems are providing quick and easy access to non-emergency municipal services and information through a single, consolidated channel that extends from the three-digit toll-free dial number (3-1-1) to any possible means that people can use to communicate with their municipal government; email, text messaging, social media, and more recently smart phone applications. In terms of making governmental operations “smarter”—more efficient, effective, transparent, and accountable—what the public experiences by using 311 services may be just the tip of the iceberg. Above the surface a 311 service center obviously serves the public as a front-end contact center—an easier and more convenient access point. What the public does not see, however, is what the 311 service center is building inside city agencies along the way. The center is a front line of customer service agents, whether registering a complaint or looking for any municipal functions other than 911 emergencies. For the back-end function, the center develops capabilities for “shared service,” with which multiple departments and agencies within the jurisdiction of a city can concentrate some of their existing customer service functions into a single business unit (the 311 center). Preliminary findings from an ongoing CTG research project, Smart Cities and Service Integration, funded partly by the Social Sciences and Humanities Research Council of Canada, highlight how the 311 service center of one city, Philadelphia (Philly311), is changing the entire city government by integrating frontline services and providing shared service capabilities. For the project, CTG researchers interviewed the City’s Mayor and Managing Director, and Philly311’s Director, Operations Manager, and Knowledge Management Specialist. The findings serve as lessons and best practices for other cities. Across the country, 311 services are serving as a key driver for integrating various customer services into a single channel and/or business unit. There are three ways to take into consideration the integration of services that otherwise are fragmented and not interconnected. Horizontal integration. The 311 center integrates non-emergency service requests and information across different government departments, agencies, and policy domains. Horizontal integration relies on the development of trust and creative collaboration among government agencies. A shared knowledge base and service level agreements are made through the horizontal integration.Citizen-centered service delivery. Citizen-centered service delivery. The 311 center brings and fits together government services so that citizens can access these services in a seamless fashion based on their wants and needs. Citizen-centered service integration is a comprehensive, concerted, and committed effort to integrate services not only across government departments but also across service channels. The Internet and new digital technologies also widen opportunities for citizen-centered service delivery. Shared service. The 311 center serves as a dedicated shared service provider within a city hall. Shared services can help to coordinate joint efforts among different departments and avoid duplication of efforts. In this way, shared services enabled by the 311 center can reduce costs, improve quality of services, and provide fewer distractions. At the end of 2008, Mayor Michael Nutter opened Philly311 as a concrete step toward the administration’s goal of smarter, faster, and better government through customer service, government efficiency, and accountability. “You don’t need to know anybody anymore to get services,” said the Mayor. 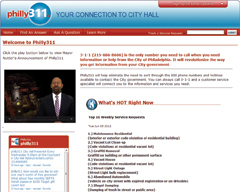 “Just call 311!” Philly311 has given Philadelphians unprecedented access to city hall. The idea, giving the public a direct way to request or complain about services and to use data about those requests or complaints to hold government accountable, was not entirely new, to cities in general, nor to Philadelphia. Philadelphia had customer hotlines, but there was no single hotline or contact point nor was there a systematic and open program for holding the city accountable. The new 311 contact center absorbed the City Hall Switchboard, the Mayor’s Action Center, the Department of Licenses and Inspections customer line, and part of the Department of Streets’ customer line. It offers various ways to contact the city: phone call, in person (Philadelphia is one of a few cities with a walk-in center), email, and social media. For horizontal integration, Philly311 consolidates non-emergency service requests and information across different departments and agencies into a single point. It enables citizen-centered service delivery by integrating services across multiple channels and between the front and back ends of a system. It also serves as a shared service center for the city departments and agencies that deliver municipal services. Serving the citizens of Philadelphia by providing courteous, fast, and accurate customer service that results in transparent access to government information and services. Philadelphia is one of the last cities of its size to activate a 311 non-emergency number. To catch up with other cities and make its government a national leader in customer service, the Nutter administration launched Philly311 under a very tight timeline (11 months from February to December in 2008), within which no other city of Philadelphia’s size has launched a 311 center operation. The aggressive timeframe itself was not a serious problem, but early challenges arose from financial constraints stemming from the budget crisis experienced by the whole city government during the national economic recession. The budget cuts meant scaling back or postponing key elements, creating two severe challenges: under-staffing (six agents short of the operational goal of 57 agents and having to use internal transfers of inexperienced agents from other departments) and under-equipping (use of old Customer Relationship Management software). However, studying the past three years of developing Philly311 offers lessons for overcoming early challenges. “[Philly311] is serving as a model for other countries and cities that are thinking about starting 311,” said Sheryl Johnson, Philly311 Operations Manager. This retrospective view on Philly311 shows how a city of any size can launch and operate a 311 system with an aggressive timeline and budgetary constraints. Strong executive support. As champions of Philly311, the top leadership group (the Mayor, the Managing Director, and their team) had a shared vision for customer service, which was critical to making their vision a reality. Dedicated project team. The internal project team’s efforts to design and implement the launch plan was central to bringing Philly311 to the city on time. Taking the time to learn from other 311s, both public and private and building processes for identifying and minimizing operational errors from the beginning grew out of the team’s commitment. Strategic partnerships with external organizations. Private sector partners with professional experiences in customer call centers helped finalize a detailed strategy and implementation plan. They also contributed to relieving the burden on Philly311 caused by under-staffing by providing some of their agents through an innovative mentoring program, to share their expertise with inexperienced agents of Philly311. Partnerships within the city government. Volunteers from city departments populated the Philly311 knowledge base. Continuous feedback and communication between Philly311 and those departments have served to both create the knowledge base and keep it current through regular updates. Philly311 is integrated with other agencies in the city through written service level agreements (SLAs) that codify each service function with a specific time frame for completion. City agencies perform hundreds of tasks, but Philly311 only handles the service requests for which an agency has agreed to be held accountable for performance on time. SLAs provide for service standards that set expectations for citizens, are measurable, and can be used to support accountability (e.g., response times). For instance, a residential property that is not being maintained must be investigated by the Department of Licenses and Inspections within 45 days; a dead animal must be removed by the Department of Streets in three days; and an abandoned vehicle within 30 days. Similar to this, if a department has agreed in its SLA to deal with a citizen’s service request in X number of days, the customer should be informed of that service standard. The department is held accountable to complete the service in that amount of time or provide information back to Philly311 as to why the service could not be completed in the agreed-upon amount of time. Philly311 is still in its infancy compared to many 311 service centers in other metropolises, but it is a case in point of the public value potential of reengineering and integrating government service efforts. Much of what is known publicly about 311 service centers is about how 311 functions at the citizen interaction level, e.g., at the front end; less is known about how the mechanisms at the back end make services happen. How Philly311, both the front and back end efforts has specifically contributed to making Philadelphia a “smarter” city was captured in a set of interviews with the City’s top management and the 311 service center staff. Insights on both the front and back end efforts are presented below. The new face of the city hall. “311 is a front door,” said Patrick Morgan, one of the launch project team members. “Before 311, Philadelphia had hundreds of front doors. Most were blocked, not open at all. [The City] created the best face of the front door for the City.” Philly311 provides new connections to city hall. The Mayor viewed it as an interaction tool, “[Philly311] connects to government as much as possible. It’s interactive to see what’s on people’s minds.” Philly311 is a connection point, and it’s more than just service. Citizen engagement. Philly311 makes it easy for citizens to become involved in their community by simply picking up the phone to report a problem they see. Once citizens see how reporting a problem can impact the neighborhood, for example, removing graffiti from a local park or clearing up a vacant property, they are further inspired to become involved in improving the neighborhood they live in. With Philly311, citizens see in concrete ways how they can make a difference in the quality of life in their community. Neighborhood liaison volunteers. One of Philly311’s unique characteristics is its neighborhood liaison program. “[The liaisons] are community leaders. We train them to use our system. They can put information directly into our system,” said Sheryl Johnson, Philly311’s Operations Manager. “That’s our strong connection in a different way of outreach. Multiple sources of information are embedded in neighborhoods.” A neighborhood liaison is someone who serves their community by reporting issues directly to the Philly311 system and provides the community with progress reports. This program is open to all residents who are willing to participate in a 90-minute training session, through which they are made familiar with various city departments and the electronic reporting system. Enabler of other programs. Philly311 enables innovative programs in other city agencies and departments. For example, PhillyRising is a neighborhood revitalization program initiated by the Managing Director’s Office. Philly311 data from residents and liaisons helps PhillyRising staff understand the immediate wants and needs of distressed neighborhoods. In addition, neighborhood information from Philly311 keeps police officers aware of potential crime-prone areas (e.g., abandoned houses). Data-driven performance management. Philly311 is part of the mayor’s overall performance improvement program. The mayor, managing director, relevant deputy mayors, and representatives from the departments and agencies meet regularly for performance management meetings; PhillyStat meetings. Philly311 data is pivotal to PhillyStat meetings providing service request and response data for monitoring agency performance. Such data-driven management is being used to guide changes in roles and responsibilities of managers throughout the city. Internal accountability. Data collected from Philly311 is used in conjunction with the PhillyStat process to track, evaluate, and, if necessary, correct service patterns in the departments. The guidelines described in service level agreements create accountability that was noticeably absent before 311. In PhillyStat sessions, each department must account, in front of the City’s executives, for their performance with respect to service standards put forth in their service level agreements. City-level information integration. 311 is about service-related information. Ms. Johnson said, “We have the information center, so we give information and get information.” Ms. Carrington-Lue also emphasized, “We are the only agency-level centralized database. Nobody has that.” The call center manages the repository of all logs of communication (calls, emails, and text messages) with citizens. The data is extracted from the repository and then used for PhillyStat or other purposes. Internal customer-oriented service. Customers come first, this is a principal of Philly311. But not just the citizen as customer, Philly311 staff see other city employees as their customers. Along with this view, the Mayor created a unique position among city-level 311 programs, Chief Customer Service Officer. The Philly 311 vision is for customer service representatives to view themselves as city ambassadors who have a major role to play in the relationship with those who live in or do business with the city. One way this has been implemented is giving Philly311’s staff extensive roles in the Customer Service Leadership Academy for internal training of all city employees. Technology integration. In addition to integrating information and services, Philly311 also relies on the integration of customer relationship management and geographic information systems software. Requests from residents can be grouped by map and zip codes, displaying where services need to be directed. Philly311 will be launching a mobile application as the next platform for users given its potential to enable more accurate positioning of reported problems and the inclusion of visual images. Philly311 has changed Philadelphia. Not completely and not alone, but in real and significant ways. City government is more open and transparent; citizens are being served, engaged, and given the opportunity to see inside government and to hold government officials accountable. Increasing citizen service during a period of budgetary constraint and creating new relationships with government agencies, citizens, and the corporate sector is no small task. But Philly311, still only three years old, has found a way to use a good idea, some basic technologies, collaboration, and hard work to make their city smarter. Much can be learned from their example.